Today I’m going to reveal where I get some of my best event marketing ideas. It all comes down to one simple technique. My big secret for getting extraordinary event marketing ideas is by picking up the phone and talking with other event marketers and organizers. Some people might be disappointed by that piece of information, but I encourage you to try it! I’m always impressed at how many people are willing to share powerful proven marketing information. During the course of the conversations people have passed along information worth thousands of dollars in time, savings, and revenue. The best people to interview are those who have a proven track record with successful events. Try to make direct contact with event marketers or actual organizers. Those are the people that have a top-down perspective on any given event. All my interviews start with me telling the person I’m interviewing who I am and why I’m calling. If they’re in front of a computer, I send them directly to my web site. It is the quickest way to show others you’re not some telemarketer. People tend to open up after they see what you look like and what you do. This would probably work tremendously well in the sales world. If you get a chance, pick up the phone and call people who’ve run successful events. If you get the right person on the phone, ask the right questions and apply the knowledge, it’s practically guaranteed to help your event. The story above was told to me by some people I recently met from Boston. Yesterday, I was fortunate enough to witness the Space Shuttle Atlantis blast off into space. It was literally one of those spine tingling events. Everyone around you is cheering and clamping enthusiastically. In all honesty watching a launch on television versus being there in person are two completely different things. 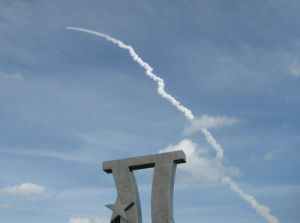 If you’re in Florida during a scheduled launch try to make it to Space View Park in Titusville. It is worth driving for a few hours. Are You Creating a Buzz? There are some events that are so extraordinary that they don’t require any advertising. A space shuttle launch is one of those spectacle events. I understand most people don’t have a space shuttle at their beckon call. Yet there are things almost every event organizer can do to create a buzz about their event. Ask yourself “Is there some way to make your event so extraordinary that you don’t need to advertise to get people to show up?” Think beyond money or advertising. Focus on getting good publicity, which costs you almost nothing versus advertising. If you can create such a buzz for your event that people can't help but attend, it's going to be very difficult not to be successful.